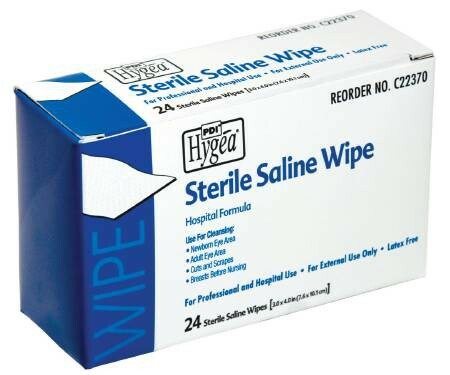 Hygea® Sterile Saline Wipes by Professional Disposables (PDI) are made to clean skin with safety in mind. These wipes used to soothe and clean areas where skin is particularly sensitive, including such applications like breast care for nursing mothers or cleaning skin areas near the eyes or mucus membranes. Each wipe is pre-moistened with saline solution making it an optimal addition among other disposable wipes. Each box comes with 24 individual wipes containing 3cc of sterile saline. Each are individually packaged for ease of transport -- something that can easily slip in a purse or wallet for later use. 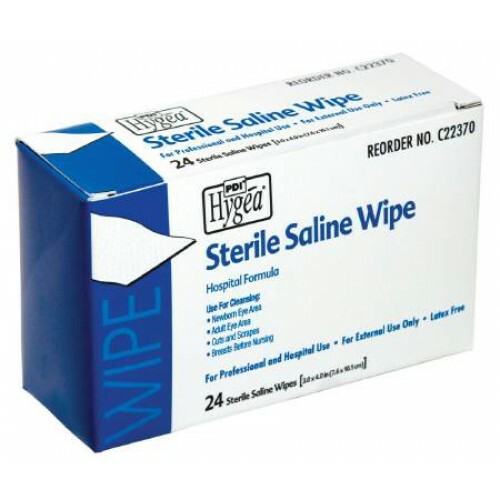 Saline wipes are also ideal for washing wounds, post-operative dressing changes and general skin care use. The Hygea® Sterile Saline Wipes are non-toxic, lint-free and are saturated with isotonic solution of sodium chloride, the chemical compound commonly known as table salt. Are these suitable for cleansing area before self-cathing? We cannot make any recommendations regarding specific items. It's best to contact the manufacturer or a medical professional for the best advice.